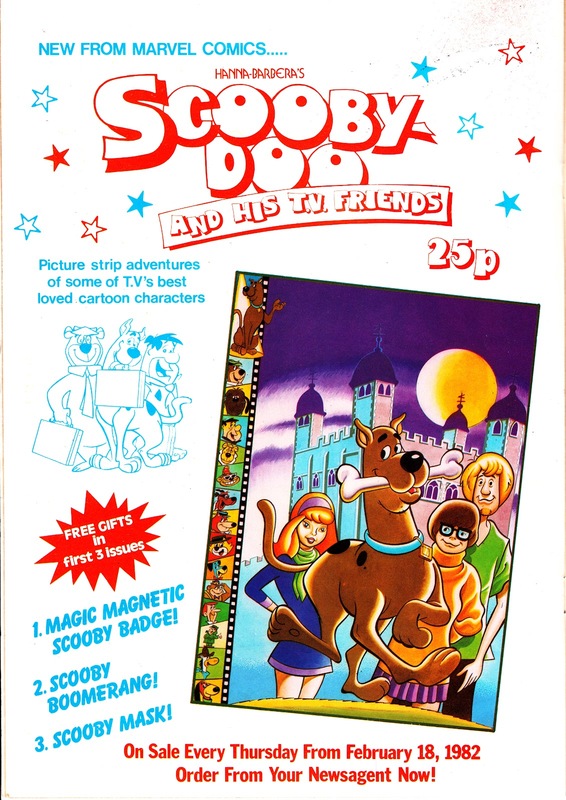 Here's a fun one from the Marvel UK vaults: SCOOBY-DOO AND HIS T.V. 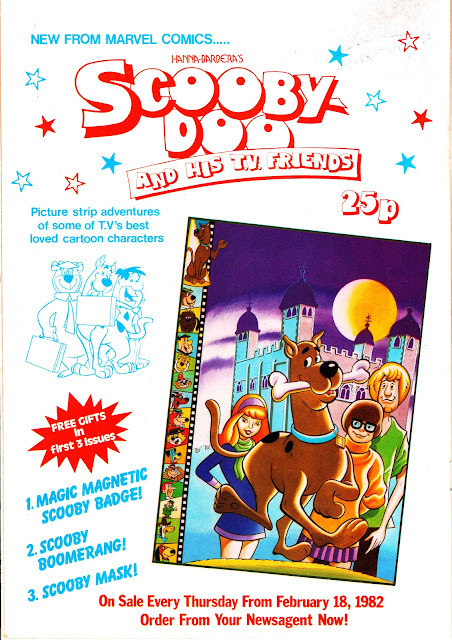 FRIENDS issue 1 (24 February 1982). 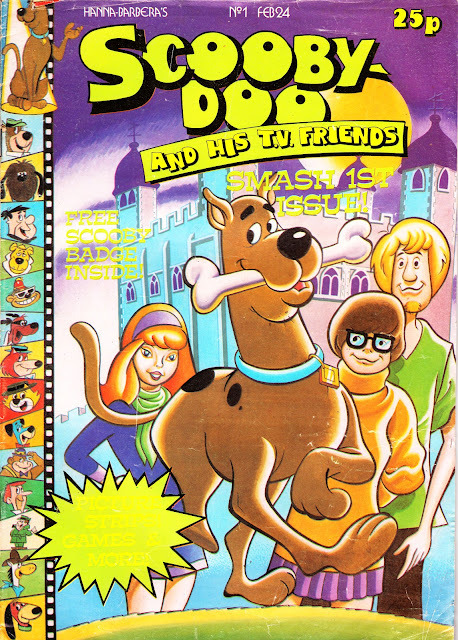 Licensed from animation house Hanna-Barbera (in a separate deal to the one that, briefly, saw Marvel US publish a range of comic books based on their Saturday Morning characters in the late seventies), this might not look it, but it's something of a landmark for the Annex of Ideas. It marks the first times the UK operation stepped-outside its usual safe zone of action/ adventure strips (either superheroes or film/ TV adaptations) to publish a weekly for a younger audience. Marvel UK had already made a tentative step into this area of publishing: WORZEL GUMMIDGE, based on Jon Pertwee's Southern TV series (and already popular, in strip form, in LOOK-IN), launched as a monthly (in the style of Marvel's other TV-based titles DOCTOR WHO and BLAKE'S SEVEN) in September (cover-dated October) 1981. The monthly was replaced by a weekly incarnation (based on the books and not, specifically, the TV show) in March 1983. Marvel added RUPERT WEEKLY, based on the adventures of the eponymous bear, in October 1982 (clocking-up 100 issues to 15 September 1984). Scooby, Worzel and Rupert were all early indicators that Marvel UK could see the British comics market changing with a readership that were younger, less interested in Marvel's traditional heroes and more likely to buy a comic based on an established media character. This eventually opened the floodgates to numerous TV and toy-based titles, beginning in ernest with THE TRANSFORMERS in September 1984. SCOOBY-DOO reprinted strips that Hanna Barbera prepared for their international licensee's, not just the material Marvel had created for their US range. 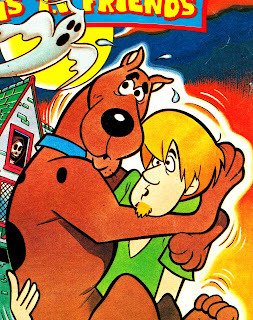 In addition to Scooby's gang, the weekly featured HB's other animated characters. The contents of an average issue were a mix of strips, an easy-to-read text story and activity pages. The same formula would also be used for the likes of THE GET ALONG GANG, CARE BEARS and even THE SPIDER-MAN COMIC and, to a lesser extent, RETURN OF THE JEDI (which added activity pages in 1984). The weekly eventually clocked-up 68 issues (ending with the issue cover-dated 8 June 1983) with three spin-off specials (Summer 1982, Christmas 1982 and Summer 1984). It was replaced, after a brief hiatus, by a similar TOP CAT weekly.